Welcome to the Freeola Support pages. 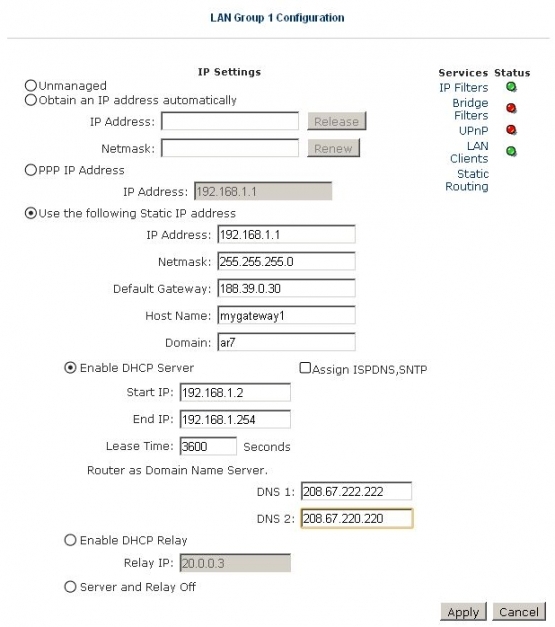 This guide is designed to take you though the basic steps for changing your DNS server settings within the Pluscom AWR-7200 router. For more internet help topics please visit our main Support Page. 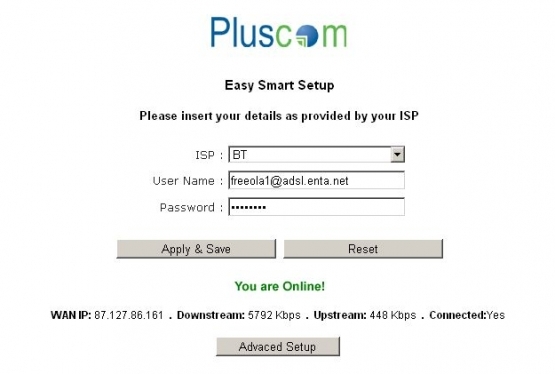 These instructions apply to the Pluscom AWR-7200 ADSL Modem Router. The settings may also apply to other Pluscom routers. Firstly you will need to Log-in to your Router Control Panel, this is a control panel held within the router itself and can be accessed by visiting the router's address using a web browser (such as Internet Explorer, Firefox or Chrome). 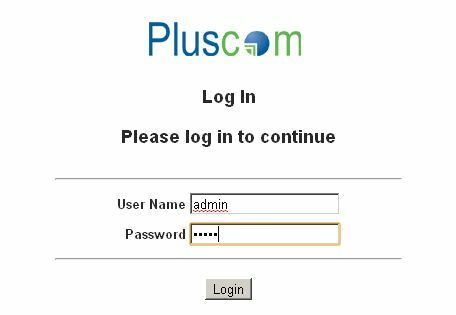 The default address for a Pluscom router is 192.168.1.1 however this may differ if it has been changed manually by yourself or your network administrator. Bring up a Web Browser (such as Internet Explorer, Firefox or Chrome) and Type http://192.168.1.1 into the Address Bar at the top of the screen. 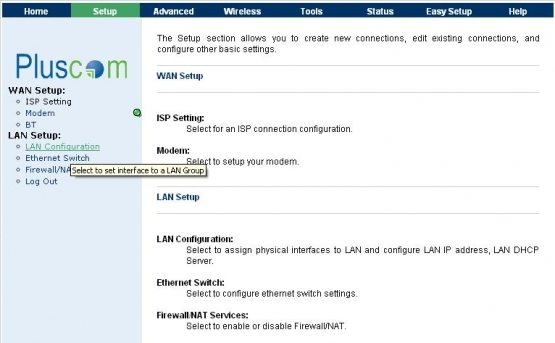 You should now be prompted for a username and password to log-in to the router. At the log-in prompt, enter 'admin' as the Log-in Username, Enter Your Log-in Password into the box provided and select Log-in. If your log-in is successful, you should be taken to the router status page. If your router was configured by Freeola or the router has recently been factory reset, the password would have been set to 'admin'. Alternatively, if you, or your network administrator originally configured the router, you may have set your own login password. 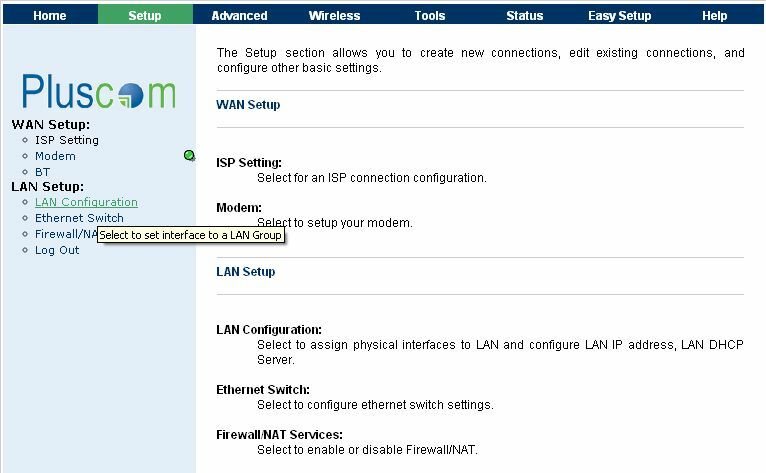 Once logged in you will need to select Advanced setup to be taken to the main configuration screen for your router. You will now need to select Setup from the top menu. 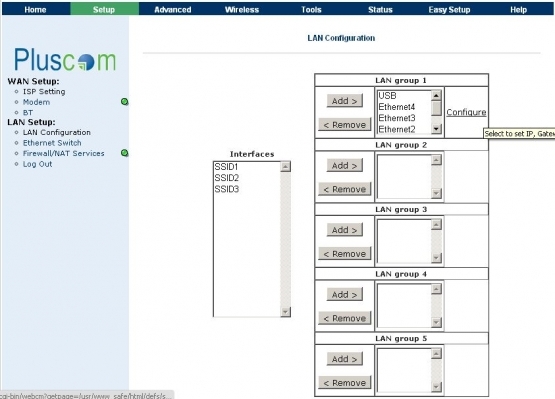 Now select LAN from the left hand navigation. 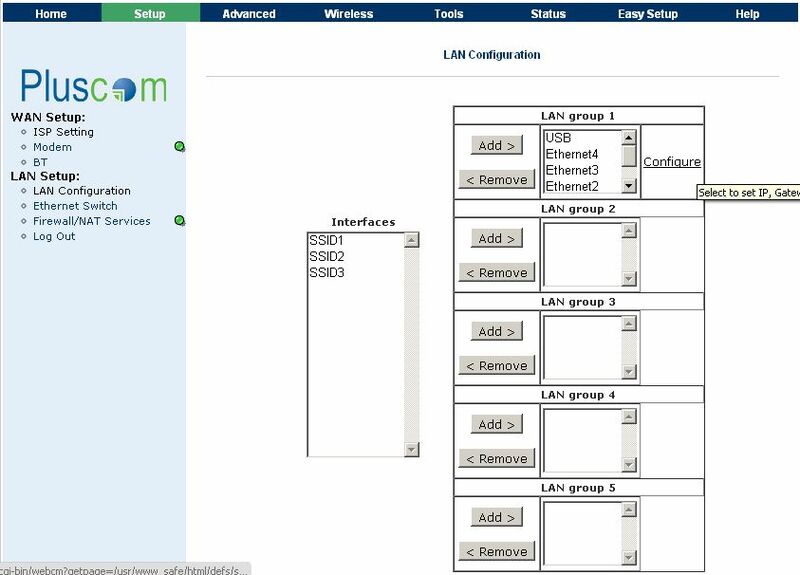 From beside the top LAN Configuration on the right hand side, select Configure. Enter the required DNS Servers into the boxes provided. For OpenDNS these are 208.67.222.222 and 208.67.220.220. Alternatively if you are not using OpenDNS, Freeola's DNS servers are 195.74.113.58 and 195.74.113.62. Select Apply to save the settings so that they take effect. As the changes have been made to the DHCP configuration, your computer will not notice the effects until you Reconnect to the Router. 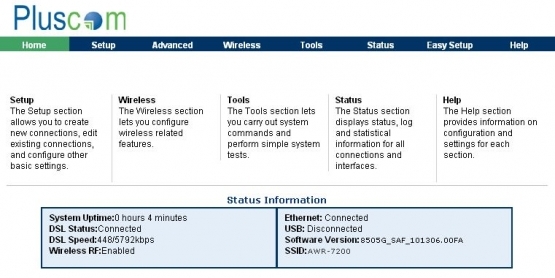 In order to reconnect to the router, you can either disconnect the cable or wireless, then reconnect, or restart either your computer or router. Once reconnected, in to order ensure your new DNS settings are working correctly, you should attempt to bring up a web page, for example http://freeola.com.